We know you’re always up for a run - even when the sun isn’t! 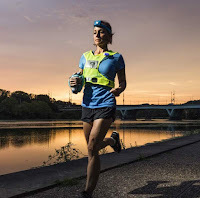 Our friend Amy Frey, coach and FleetFeet team member, put together some safety tips for running in dark conditions. Whatever time of day we run, we are sharing the roads. The cardinal rule is that we want to see and be seen. This holds true both in broad daylight and dark evenings. Wear bright colors (neon yellow, pink), white and/or apparel with integrated reflective elements (e.g., stripes on pants or shirt). Many pieces of apparel appear “flat” to the eye, but light up when a light bounces off the fabric. Most running pants tend to be dark, so make sure you’re wearing something bright for balance. Small and often magnetic blinking lights can be affixed almost anywhere. They're versatile, relatively inexpensive and they will definitely increase your visibility. Attach them under the laces of your favorite running shoes and you won't even know they’re there. The movement of your feet as you’re running means drivers will notice you. Some brands to look for are Nathan and Amphipod. Add a blinking ankle or arm band to further increase your ability to be noticed on the road. Invest in a reflective vest (often with lights and other reflective elements). Add a headlamp, a handheld light or a light to your running cap. Handheld lights offer the ability to guide your way and can be used to alert a vehicle that you're there by gesturing with it, and they often have a red blinking light, too. (Plus you won't blind your running buddy when you turn to talk to them!) Many of these lights are now rechargeable, which is a great feature. 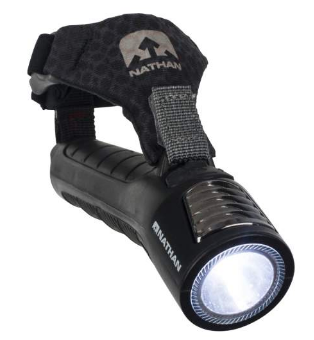 Headlamps by Petzl, Nathan, Amphipod offer great options; Nathan's Zephyr 300 is a lightweight and powerful handheld. White lights allow you to see where you’re going (and often have blinking modes for low-light situations) and red lights allow you to be seen. Lights and/or reflective gear should be put on the minute the daylight dims. This includes dusk, early morning, night, and cloudy days. Fog is a particularly hazardous condition, but, if you must run, wear brightly colored clothing, have blinking lights on, possibly a headlamp or handheld for added safety and don’t run in the road! Drivers are unable to see far ahead of themselves, so they likely won’t see you ‘til they’re upon you. If you can’t see more than a few feet ahead of yourself, consider what could happen if a driver can’t see you. Fortunately, in this area dense fog is a rare occurrence, but it does happen. Well, almost anytime is the right time to run, but running at night does bring challenges. If you're in the road, run single file or no more than two abreast. Don't just dart across the road - wait! You think you can be seen, but drivers aren't necessarily looking for a runner being out there in the dark. MAKE EYE CONTACT with the driver. Take out one earbud or use a headphone like Aftershokz that lets you stay in tune with your surroundings. Let someone know where you're going if you're alone. Consider Road ID or WearSafe. And, most important: Remember, you want to SEE what’s ahead of you, but you also want to BE SEEN. I always want to light up the night. Run Safe. Thanks to our friends at FleetFeet for providing this guest post. We'll be bringing you tips on the blog every month from experts in the community - please tell us what you want to hear about, info@hartfordmarathon.com. Want to hang out with your friends in style and at the same time are you looking out for more fun? If your answer is yes, then you must look out for Events In Geneva. There is a mixture of events and shows that are prepared to be organised on the stage of the city. Right from concerts, theatre, dance and a lot of variations are here to rock you with entertainment. So, get the bookings done with us at https://eventsgeneva.ch/. Protect yourself in winter temps!